The new entry garden really is a secret—until you walk through the path to the front door and it reveals itself to you. 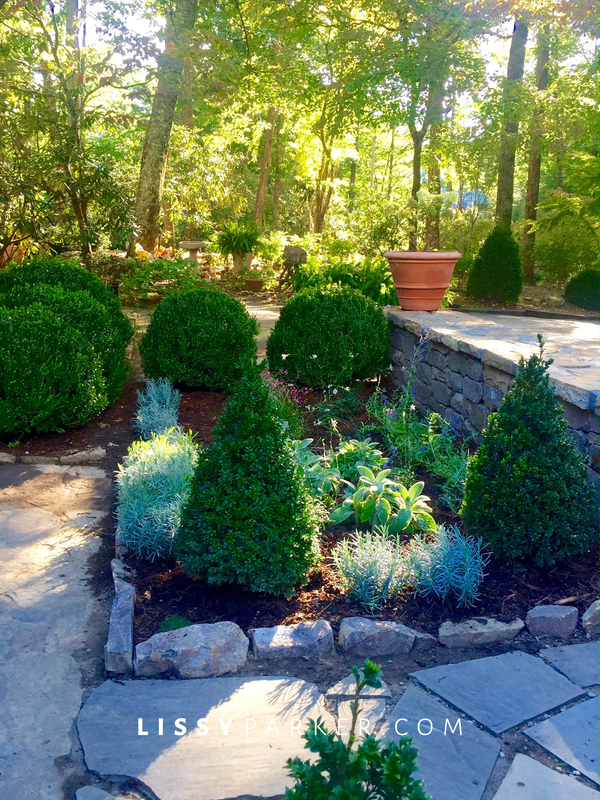 I love the new stone wall my architect Keven Hawkins added—what a bonus when your architect also designs gardens! The wall gives us privacy from the road and a beautiful secluded spot to enjoy the view. My faux bois bench looks great under the window box and is the perfect perch near the kitchen Dutch door—thanks for the idea, Martha! The wall also supports large terracotta planters that will permanently line the entry drive—à la Furlow Gatewood. We have planted mini limelight hydrangeas in the pots—hope they survive the snow. These photos were taken just after installation of the garden. I will follow up later when it is all complete and lovely. We are also going to add a small gate to keep the puppies safe. I have a great Gate Board on Pinterest—I hope I can decide soon, lol. Have a great day and go plant a new garden this fall. Everything is on sale now, and it’s a great time to plant! New beds filling up with plants—lavender variety ‘Phenomenal’ good to zone 5. Stone patio is original to house—lucky break for me. Shady corner has ferns, hosta and bugbane—pigeon statue from the Charles Faudree estate. Conical boxwood from Boxwoods in Atlanta. I can hardly wait for it all to be finished! Looks great! Where did you buy your Dutch doors? Love them! Debbie, The Dutch doors were purchased by my architect, Keven Hawkins. Just give him a call if you need one. Looks great Lissy’s and I love all the boxwoods and plantings. Love the stone walls my fav! Thank you Cathy. Phase two is going in tomorrow. We are adding tow large red maples.